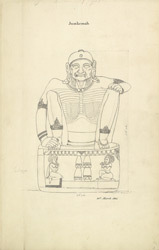 Pen and ink drawing of an image of Chamunda, by an anonymous artist, taken from an album of 37 drawings (43 folios) of sculpture at Jajpur, Puri, Bezwada and Sitanagar made during a journey from Bengal through Orissa to the Coromandel Coast, part of the MacKenzie Collection, dated 1815. Colin MacKenzie (1754-1821) joined the East India Company as an engineer at the age of 28 and spent the majority of his career in India. He used the salary he earned from his military career as a Captain, Major and finally a Colonel to finance his research into the history and religion of Indian and Javan culture, collecting many sketches and drawings along the way. Jajpur is a sacred pilgrimage site in Orissa that is situated on the Vaitarani River. There are numerous temples at the site, the most important being the shrine of the mother Goddess Viraja (Durga), and the shrine to Varaha, the incarnation of Lord Vishnu as a boar. This drawing depicts a figure of Chamunda, a terrifying manifestation of Durga. Chamunda is one of the Saptamatrikas, the seven mothers of Hindu mythology. These seven goddesses are fierce forms of the goddess, who is a symbol of the reproductive forces of nature and female fecundity worshipped in sakti cults. The seven mothers are usually depicted as the consorts of the major gods and their worship was widespread in Orissa between the 7th and the 11th centuries.